July: The Arsenal of Democracy (assisted, covertly, by ARCADE Team Three) leads a raid on an abandoned church in Denver, believed to be housing Dracula. They are nearly wiped out, with only a badly injured Patriot escaping capture or worse, and managing to warn AEGIS that Dracula has joined forces with Herald Sisyphus, the Oblivion Knight -- and Ultimaid, who has apparently betrayed the Arsenal. Last edited by Davies on Tue Jul 03, 2018 4:48 am, edited 1 time in total. WHY IN THE NAME OF DUGH MCCLURE.....Ok,The Arsenal getting stomped into the ground by the first three is one thing,but ULTIMAID betraying then?! Does Dracula somehow have the three under his sway? Unlikely, given their nature, but curious because traditionally Vlad has three "brides". Given all three are more powerful than he is, and have either powerful patrons (Oblivion Knight) and/or friends and family (Ultimaid), the old vampire may have gotten a bit too ambitious this time around. Interested in where this is going. According to the Patriot's report, the Herald and the Knight did not appear to have been vampirized. Annnnnd that's all I'm going to say on the subject for now. Towards the end of the thirty-third century of the common era, the regions of space best known to Earth-descended humanity looked something like this. 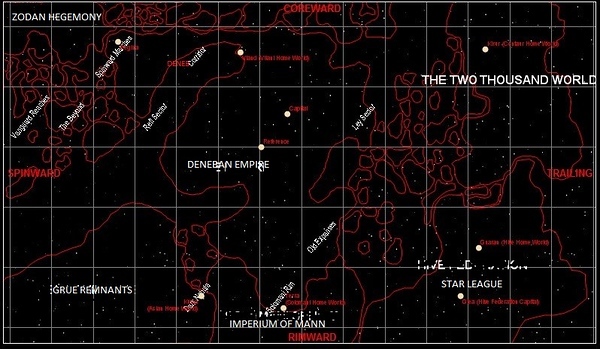 The Sol system was theoretically the sector capital of the Solarian Rim sector of the Deneban Empire, but though taxes were paid and bases for the Imperial Fleet were maintained, it had been centuries since the Empire had shown any particular interest in this region of space, being vastly more concerned with regions of the Empire closer to Deneb and with their enemies in the anti-psionic Zodan Hegemony. Even those nations of the Sol system which were aware of the existence of the Empire (as most of Earth's civilizations were decidedly not) returned this lack of interest in kind. The Empire was ruled by a large family of superhumans, supposedly descended from Earth's legendary Atom Family, though notably lacking that group's fabled altruism. For the most part, as long as the taxes were paid and the Empire's rule of the space between the stars was unchallenged, the Empire was content to allow its subject territories to govern themselves as they saw fit. Thus, a vast variety of system and planetary governments flourished under the frequently notional rule of Deneb. Should one of the royal family take an interest in a given world, however, all bets were off. There were very few limits on what a royal was permitted to do. Rimward of the Solarian Rim lay the Imperium of Mann -- or at least those sectors of known space claimed by the Imperium. Their homeworld was located in a region of space far Spinward of known space, but connected to it by a gigantic wyrmhole that opened up near the Imperium's regional capital. Their ancestors had formerly ruled parts of Earth, and believed that rule of the planet (and the other planets of the Sol system) was the divine right of their immortal Emperor. However, the many threats to their rule of not only these sectors, but also their territories on the far side of the wyrmhole, had thus far prevented them from directing enough force towards the Solarian Rim to overcome its defenders. Spinward of the Imperium of Mann were the regions formerly known as the Grue Unity, or the Grue Remnants as they were better known. At the very start of the Great Disasters, the Grue Metamind and an entity known as the Dragon had apparently destroyed each other and the entire planet of Gruen Prime in the process. What remained of the Unity were a dozen or more pocket empires ruled over by Metagrues, with a handful of states (such as the Illthusian Tyranny) governed by former slaves of the Grue. Despite their mutual hostilities, the Metagrues could and would unite to oppose intrusions by the Imperium. Trailing the Imperium of Mann was the Star League, a multi-species polity that claimed descent from the fallen Confederation, but was in truth territory which had been secretly ruled by the Argents. Thought defeated in the early 21st century after Collapsar's disappearance forced Tellax the Redeemer into a standby mode, the ancient construct's servants continued to serve what they believed to be their master's wishes. Refugees from the Confederation were welcomed into the Star League's care, becoming new experimental subjects for the Argents' studies in directed evolution. Coreward of the Star League was a polity dubbed The Ten Thousand Worlds (which encompassed an order of magnitude more inhabitable planets than that.) Descended from worlds which had been ruled by the Mihral Hegemony, their ancestors had thrown off the rule of the Mihral in the twenty-fifth century, and built a new civilization. Tragically, owing to lingering hatred of the Mihral and their most common enforcers, this civilization was every bit as hostile towards 'roundheaded' (i.e. human-like) species as the Imperium of Mann was hostile towards non-human-like species. Roundheaded refugee fleets driven from the Ten Thousand Worlds reached the Confederation in the mid 26th century, and some believe that this 'invasion' may have been part of the Great Disasters. Regardless, the Ten Thousand Worlds were unceasingly opposed to the Deneban Empire, though there was very little contact between the two nations. Author's Note: That map does look a little familiar, doesn't it? <belated> Thanks! I might be posting character sheets for some of the NPCs encountered in my current campaign in the Character Sheet thread once we reach a break in actual play. Mercury: Closest planet to the sun, Mercury is known for its solar power collection system -- which, owing to its position and advances in materials science, is many millions of times more efficient than the solar panels used in the twentieth century -- and as the adopted home planet of a humanoid species known as the Eudaimons. These solar-powered superhumans first visited the Sol system in the 19th century, when one of their explorers was shipwrecked on Earth and gave birth to her child before expiring due to a lack of appropriate medical care. The child was raised by humans and briefly achieved some notoriety before being rescued by an Eudaimon search party. Six hundred years later, the Confederation of Planets assisted the survivors of their species to resettle on Mercury after their homeworld's star went nova. While pledged to the defense of the solar system, recent centuries have seen them largely focused on the internal politics of their three nations -- Siraph, Shedem, and Haggai. Venus: Venus was terraformed to be a near-duplicate of Earth in the early years of the Confederation, and was a popular tourist destination through that era, with many cities from Earth's Baroque period recreated there, most notably Venice. Tragically, all this was undone by the attack of the Scourge Fleet, whose bombardments returned Venus to the hellish state that it knew in the 20th century, if not worse for its now-irradiated state. A handful of expeditions from the System Administration have visited the planet over the past three centuries, but no permanent settlement has been attempted. Anything that could be found here, can be more easily found elsewhere. Earth: Mostly harmless. A more complete summary of the planet's balkanized state will await a future article. Mars: Home of the System Administration as well as what passes for the Sol sector's governing authority, Mars was the only planet of the Sol system to be spared the Scourge Fleet's attentions. This was the result of the early SysAdmin's decision to use the entirety of its space-faring assets -- all that remained of the Confederation's main spacefleet -- to protect Mars (which had also been spared the worst of the previous Great Disasters) at the expense of every other inhabited planet in the system. Needless to say, the SysAdmin is not exactly popular in some quarters, and its authority is frequently questioned or even ignored. Nonetheless, Mars' thriving ecology, as well as the vast population spread across its five continents, speak to the positive side of this decision. Jupiter: The Scourge Fleet devastated the various terrestrial and extra-solar colonies spread throughout the Jovian moons, and tried -- but failed -- to exterminate Jupiter's flumph population as well. The flumph, formerly a staunch ally of humanity, have not responded to attempts by the SysAdmin or other human agencies to communicate with them since that time, with one telepathic probe indicating that they have decided to pretend humanity doesn't exist for at least a few more centuries. Saturn: As only a small portion of the Scourge Fleet was directed towards it, Titan was also able to outlast their siege thanks to force field technology which shielded the entire moon. The Titanians are perhaps inordinately proud of this fact, and only the fact that their current standard of living probably would not survive a second centuries-long siege has kept them from outright rebellion against the SysAdmin. Titanian force field technology is understandably considered the best in the system. Vulcan: An artificial planet, essentially a single gigantic non-sapient machine populated by self-replicating sapient machines, Vulcan arrived in the solar system towards the end of the Scourge. The populace quickly negotiated an alliance with Mars' 'servant' population, and through them with the biological inhabitants of the Sol system, and proceeded to attack the Scourge Fleet. It's not clear whether the arrival of this new force was what ended the scourge, but the Vulcanians are happy to take as much of the credit as anyone will give them. A popular vacation spot for servants, and even visited by some biologicals. Uranus: The site of a handful of scientific outposts during the Confederation era. All contact with such locations was lost during the Great Disasters, and even those which managed to survive that were surely wiped out during the Scourge. This is the official opinion of the SysAdmin, at least, but this opinion has never been officially verified. "Data about a surviving Uranian outpost I want to sell you" is used in much the same way as "a bridge I want to sell you" in discussion about con artistry in the current era. Neptune: Recently recolonized by a group of cold-generating transhumans from Esperance sub-sector (spinward of Vega sub-sector) who are creating a religious retreat where they can worship a pantheon of entities known as the Cold Ones. They have politely refused all communications from the SysAdmin. Surely they couldn't be up to anything. Last edited by Davies on Sun Mar 17, 2019 10:20 pm, edited 1 time in total. So, if you're a human or human-adjacent, Mars is probably the place to be. Kind of like the capital city of the solar system. <nod> While the Five Cities each have things that no city on Mars does, there are thousands of cities with comparable populations and living standards there.